Three Law School alums took action in Sudan this year: Nathan Miller ’01 and Maya Steinitz (LL.M. 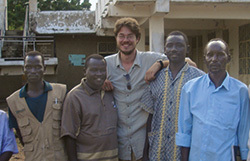 ’00) launched the nonprofit Rule of Law International (RoLI) to help the Sudanese develop a constitutional process, and David Pressman ’04 drew media attention to the humanitarian crisis in Darfur, with the help of actor George Clooney and George’s father, Nick. When the Sudanese civil war ended last year, Miller (pictured at left), who had been working with the Sudanese People’s Liberation Movement (SPLM) to create a rule of law program in Southern Sudan, saw an opportunity to help them in their post-peace agreement constitutions. That’s when he started RoLI. “There was a desperate need for the people of Sudan to get legal consultation that they could trust,” says Miller, the executive director. With Miller in Sudan, and Steinitz plus a 50-lawyer team from Latham & Watkins working pro bono in Manhattan, RoLI helped hammer out constitutional frameworks at the national, subnational and state levels. The unlikely trio and a cameraman soon set off for Nairobi, Kenya. From there, they hopped a single-engine Cessna to Southern Sudan, where they spent the night in stifling hot huts crawling with tarantulas, then took another plane and also a Jeep across dirt roads to the Oure Cassoni Refugee Camp at the Chad-Darfur border to interview the refugees on camera. When they returned home, the Clooneys spoke at the rally and appeared on CNN, Oprah and Today, to name a few media outlets. “We were able to use George’s celebrity to propel these horrific stories into virtually every media market and hopefully into the American conscience,” says Pressman. A long, arduous trip to fulfill his promise, but one that may lead to much-needed aid for the suffering Sudanese.